The origins of the Cold War can be traced through numerous conflicts between the Soviet Union and Western nations, starting with the Russian Revolution in 1917. The Cold War between the U.S. and Soviet Union originated from postwar disagreements, conflicting ideologies, and fears of expansionism. At both the Yalta Conference and Potsdam Conference, U.S. and Soviet leaders sharply disagreed over the future of the post-war world. After the war, the U.S.’ s primary goal was prosperity through open markets and a strengthened Europe. The Soviet Union sought prosperity through security; a rebuilt Europe would be a threat. Similarly, the U.S. advocated capitalism while the Soviets advocated communism. Both the U.S.’ s ” Long Telegram ” and the Soviets’ “Novikov Telegram” displayed a sense of mutual distrust. Churchill’s “iron curtain” speech and the creation of Cominform further divided the world into two blocs. “iron curtain”: This term named the imaginary boundary dividing Europe into two separate areas from the end of World War II in 1945 until the end of the Cold War in 1991. Eastern Bloc: The group of communist states of Central and Eastern Europe, generally including the Soviet Union and the countries of the Warsaw Pact. Cold War: The period of hostility short of open war between the Soviet Bloc and the Western powers, especially the United States, 1945–91. satellite states: A political term for a country that is formally independent, but under heavy political and economic influence or control by another country. The term is used mainly to refer to Central and Eastern European countries during the Cold War that were under the hegemony of the Soviet Union. Cominform: Founded in 1947, this was was the common name for what was officially referred to as the Information Bureau of the Communist and Workers’ Parties. It was the first official forum of the international communist movement since the dissolution of the Comintern, and confirmed new realities after World War II, including the creation of an Eastern bloc. The Cold War most directly originates from the relations between the Soviet Union and the allies (the United States, Great Britain, and France) in the years 1945–1947. After this period, the Cold War persisted for more than half a century. Events preceding the Second World War and the Russian Revolution of 1917 fostered pre- World War II tensions between the Soviet Union, western European countries, and the United States. A series of events during and after World War II exacerbated these tensions, including the Soviet- German pact during the first two years of the war leading to subsequent invasions, the perceived delay of an amphibious invasion of German-occupied Europe, the western allies’ support of the Atlantic Charter, disagreement in wartime conferences over the fate of Eastern Europe, the Soviets’ creation of an Eastern Bloc of Soviet satellite states, western allies scrapping the Morgenthau Plan to support the rebuilding of German industry, and the Marshall Plan. As a result of the 1917 Bolshevik Revolution in Russia and its subsequent withdrawal from World War I, Soviet Russia found itself isolated in international diplomacy. Leader Vladimir Lenin stated that the Soviet Union was surrounded by a “hostile capitalist encirclement,” and he viewed diplomacy as a weapon to keep Soviet enemies divided, beginning with the establishment of the Soviet Comintern calling for revolutionary upheavals abroad. Tensions between Russia (including its allies) and the West turned intensely ideological. After winning the civil war, the Bolsheviks proclaimed a worldwide challenge to capitalism. Subsequent Soviet leader Joseph Stalin, who viewed the Soviet Union as a “socialist island,” stated that the Soviet Union must see that “the present capitalist encirclement is replaced by a socialist encirclement.” As early as 1925, Stalin stated that he viewed international politics as a bipolar world in which the Soviet Union would attract countries gravitating to socialism and capitalist countries would attract states gravitating toward capitalism, while the world was in a period of “temporary stabilization of capitalism” preceding its eventual collapse. Differences in the political and economic systems of Western democracies and the Soviet Union—socialism versus capitalism, economic independence versus free trade, state planning versus private enterprise—became simplified and refined in national ideologies to represent two ways of life. The atheistic nature of Soviet communism concerned many Americans. The American ideals of free determination and President Woodrow Wilson ‘s Fourteen Points conflicted with many of the USSR’s policies. Several postwar disagreements between western and Soviet leaders were related to their differing interpretations of wartime and immediate post-war conferences. At the February 1945 Yalta Conference, they could not reach firm agreements on crucial postwar questions like the occupation of and postwar reparations from Germany. Given Russia’s historical experience of frequent invasions and the immense death toll of the war (estimated at 27 million), the Soviet Union sought to increase security by dominating the internal affairs of its bordering countries. Stalin was determined to use the Red Army to gain control of Poland, dominate the Balkans, and destroy Germany’s capacity to engage in another war. On the other hand, the United States sought military victory, the achievement of global American economic supremacy, and the creation of an intergovernmental body to promote international cooperation. The key to the U.S. vision of security was a postwar world shaped according to the principles laid out in the 1941 Atlantic Charter—a liberal international system based on free trade and open markets. This would require a rebuilt capitalist Europe with a healthy Germany at its center to serve once more as a hub in global affairs. At the Potsdam Conference in July 1945, the Allies met to decide how to administer the defeated Nazi Germany. Serious differences emerged over the future development of Germany and Eastern Europe. 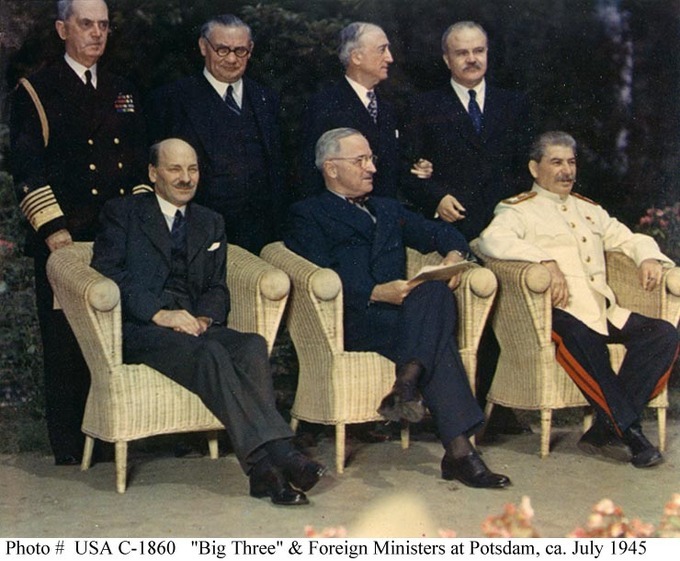 At Potsdam, the U.S. was represented by President Harry S. Truman, who relied on a set of advisers who took a harder line toward Moscow than his predecessor Franklin Roosevelt. Under Truman’s administration, officials favoring cooperation with the Soviet Union and the incorporation of socialist economies into a world trade system were marginalized. The atomic bombings of Hiroshima and Nagasaki were in part a calculated effort on the part of Truman to intimidate the Soviet Union, limiting its influence in postwar Asia. Indeed, the bombings fueled Soviet distrust of the U.S. and are regarded by some historians not as only as the closing act of World War II, but as the opening salvo of the Cold War. U.S. leaders hoped to shape the postwar world by opening up markets to international trade. The U.S., as the world’s greatest industrial power and one of the few countries physically unscathed by the war, stood to gain enormously from opening the entire world to unfettered trade. The U.S. would have a global market for its exports and unrestricted access to vital raw materials. Determined to avoid another economic catastrophe like that of the 1930s, U.S. leaders saw the creation of the postwar order as a way to ensure continuing prosperity. This Europe required a healthy Germany at its center. The postwar U.S. was an economic powerhouse that produced 50% of the world’s industrial goods and an unrivaled military power with a monopoly on the new atom bomb. It also required new international agencies: the World Bank and International Monetary Fund, created to ensure an open, capitalist, international economy. The Soviet Union opted not to take part. The American vision of the postwar world conflicted with the goals of Soviet leaders, who were also motivated to shape postwar Europe. Since 1924, the Soviet Union placed a high priority on its own security and internal development. After the war, Stalin sought to secure the Soviet Union’s western border by installing communist-dominated regimes under Soviet influence in bordering countries, called the Eastern Bloc. During and immediately after the war, the Soviet Union annexed several Eastern European countries as satellite states, a move viewed as expansionist and aggressive by Western powers. Many of these were originally countries effectively ceded to it by Nazi Germany in the Molotov-Ribbentrop Pact, before Germany invaded the Soviet Union. These later annexed territories include Eastern Poland, Latvia, Estonia, Lithuania, part of eastern Finland, and northern Romania. In February 1946, U.S. diplomat George F. Kennan delivered a memo from his post in Moscow which came to be known as the Long Telegram. The Long Telegram sought to explain recent Soviet behavior to Kennan’s superiors in Washington, and further advised a hard line against the Soviets. It argued that the Soviet Union was motivated by both traditional Russian imperialism and Marxist ideology, which advocated the expansion of socialism and the toppling of capitalist regimes. In Kennan’s view, Soviet behavior was inherently expansionist and paranoid, posing a threat to the United States and its allies. That September, the Soviets produced the Novikov Telegram. This telegram, sent by the Soviet ambassador to the U.S., portrayed the latter as in the grip of monopolistic capitalists bent on building up military capability “to prepare the conditions for winning world supremacy in a new war.” These differing interpretations of international politics in the immediate postwar era set the stage for a succession of diplomatic, economic, and military confrontations between the two powers. On March 5, 1946, Winston Churchill gave a speech declaring that an “iron curtain” had descended across Europe. This metaphorical curtain divided east from west, leaving those nations behind it “subject, in one form or another, not only to Soviet influence but to a very high and in some cases increasing measure of control from Moscow.” To the Soviets, the speech seemed to intended to incite the West to war with the USSR, as it called for a broad western alliance against the Soviets. In response to perceived western aggression, in September 1947 the Soviets created Cominform to enforce orthodoxy within the international communist movement and tighten political control over Soviet satellites through coordination of communist parties in the Eastern Bloc. The Cold War had begun. The Cold War began with the formation of the Eastern Bloc, the implementation of the Marshall Plan, and the Berlin Blockade. Tensions between world powers grew as the Soviet Union began to form the Eastern bloc, turning Central and Eastern European countries such as Poland, Lithuania, and Romania into satellite states. Western powers viewed Soviet control over the Eastern bloc with suspicion, believing it demonstrated aggression on the part of the Soviet Union. Announced in 1947, the Marshall Plan was the United States’ comprehensive assistance program for Europe. The Soviet Union viewed this plan with suspicion and forbade Eastern bloc states from accepting aid. In June 1948, the Soviet Union initiated the Berlin Blockade, which cut off all supply routes to the German city. In response to the Blockade, Western powers initiated the Berlin Airlift, the success of which eventually ended the blockade. Eastern Bloc: The largely Communist countries of the eastern world, especially Eastern Europe, especially in the Cold War era. satellite states: A country that is formally independent, but under heavy political and economic influence of or control by another country. The term is used mainly to refer to Central and Eastern European countries during the Cold War, who were “satellites” under the hegemony of the Soviet Union. Marshall Plan: The large-scale American program to aid Europe in which the United States gave monetary support to help rebuild economies after the end of World War II in order to prevent the spread of Soviet communism. The United States and Soviet Union eventually emerged as the two major superpowers after World War II. The 1956 Suez Crisis suggested that Britain, financially weakened by two world wars, could no longer pursue its foreign policy objectives on an equal footing with the new superpowers without sacrificing convertibility of its reserve currency as a central goal of policy. Despite attempts to create multinational coalitions or legislative bodies (such as the United Nations), it became increasingly clear that the U.S. and Soviet superpowers had very different visions about what the postwar world ought to look like. The two countries opposed each other ideologically, politically, militarily, and economically. The Soviet Union promoted the ideology of communism, characterized by a planned economy and a one-party state. In contrast, the U.S. promoted the ideologies of liberal democracy and the free market. The division of the world along U.S.-Soviet lines was reflected in the NATO and Warsaw Pact military alliances, respectively. Most of Europe became aligned with either the United States or the Soviet Union. These alliances implied that these two nations were part of a world organized into a bipolar balance of power, in contrast with a previously multi-polar world. During the opening stages of World War II, the Soviet Union laid the foundation for the Eastern Bloc by directly annexing several countries as Soviet Socialist Republics that were initially ceded to it by Nazi Germany in the Molotov-Ribbentrop Pact. These included eastern Poland, Latvia, Estonia, Lithuania, part of eastern Finland, and eastern Romania. In Asia, the Red Army overran Manchuria in the last month of the war and went on to occupy the large swath of Korean territory north of the 38th parallel. The Eastern European territories liberated from the Nazis and occupied by the Soviet armed forces were added to the Eastern Bloc by converting them into satellite states. The Soviet-style regimes that arose in the satellite states not only reproduced Soviet command economies, but also adopted the brutal methods employed by Joseph Stalin and Soviet secret police to suppress real and potential opposition. Following the Allies’ May 1945 victory, the Soviets effectively occupied Eastern Europe, while strong U.S. and Western allied forces remained in Western Europe. In Allied-occupied Germany, the Soviet Union, United States, Britain, and France established zones of occupation and a loose framework for four-power control. Soviet occupation of Eastern bloc states was viewed with suspicion by Western powers, as they saw this occupation as a sign of Soviet willingness to use aggression to spread the ideology of communism. Post-War Allied Occupation Zones in Germany: Occupation zone borders in Germany, 1947. The main Allied powers established zones of occupation in Germany after World War II. In early 1947, Britain, France and the United States unsuccessfully attempted to reach an agreement with the Soviet Union for a plan envisioning an economically self-sufficient Germany, including a detailed accounting of the industrial plants, goods, and infrastructure already removed by the Soviets. In June 1947, in accordance with the Truman Doctrine, the United States enacted the Marshall Plan, a pledge of economic assistance for all European countries willing to participate, including the Soviet Union. The plan’s aim was to rebuild the democratic and economic systems of Europe and counter perceived threats to Europe’s balance of power, such as communist parties seizing control through revolutions or elections. The plan also stated that European prosperity was contingent upon German economic recovery. One month later, Truman signed the National Security Act of 1947, creating a unified Department of Defense, the Central Intelligence Agency (CIA), and the National Security Council (NSC). These would become the main bureaucracies for U.S. policy in the Cold War. Stalin opposed the Marshall Plan. He had built up the Eastern Bloc protective belt of Soviet controlled nations on his Western border and wanted to maintain this buffer zone of states and a weakened Germany under Soviet control. Fearing American political, cultural, and economic penetration, Stalin eventually forbade Soviet Eastern bloc countries from accepting Marshall Plan aid. Stalin believed that economic integration with the West would allow Eastern Bloc countries to escape Soviet control, and that the U.S. was trying to buy a pro-U.S. realignment of Europe. The Soviet Union’s alternative to the Marshall plan, purported to involve Soviet subsidies and trade with eastern Europe, became known as the Molotov Plan. As part of the economic rebuilding of Germany in early 1948, representatives of a number of Western European governments and the United States announced an agreement for a merger of western German areas into a federal governmental system. In addition, in accordance with the Marshall Plan, they began to re-industrialize and rebuild the German economy, including the introduction of a new Deutsche Mark currency to replace the old Reichsmark currency that the Soviets had debased. Shortly thereafter, Stalin instituted the Berlin Blockade (June 24, 1948 – May 12, 1949), one of the first major crises of the Cold War, preventing food, materials, and supplies from arriving in West Berlin. The Soviet Union blocked the Western Allies’ railway, road, and canal access to the sectors of Berlin under Western control. The Soviets offered to drop the blockade if the Western Allies withdrew the newly introduced Deutsche mark from West Berlin. In response, the Western Allies organized the Berlin airlift to carry supplies to the people of West Berlin, a difficult feat given the city’s population. Aircrews from the United States Air Force, the British Royal Air Force, the Royal Canadian Air Force, the Royal Australian Air Force, the Royal New Zealand Air Force, and the South African Air Force flew more than 200,000 flights in one year, providing the West Berliners up to 8,893 tons of necessities such as food and fuel each day. The Soviets did not disrupt the airlift for fear this might lead to open conflict. By the spring of 1949, the airlift was clearly succeeding, and by April it was delivering more cargo than had previously been transported into the city by rail. On May 12, 1949, the USSR lifted the blockade of West Berlin. The Berlin Blockade served to highlight the competing ideological and economic visions for postwar Europe. 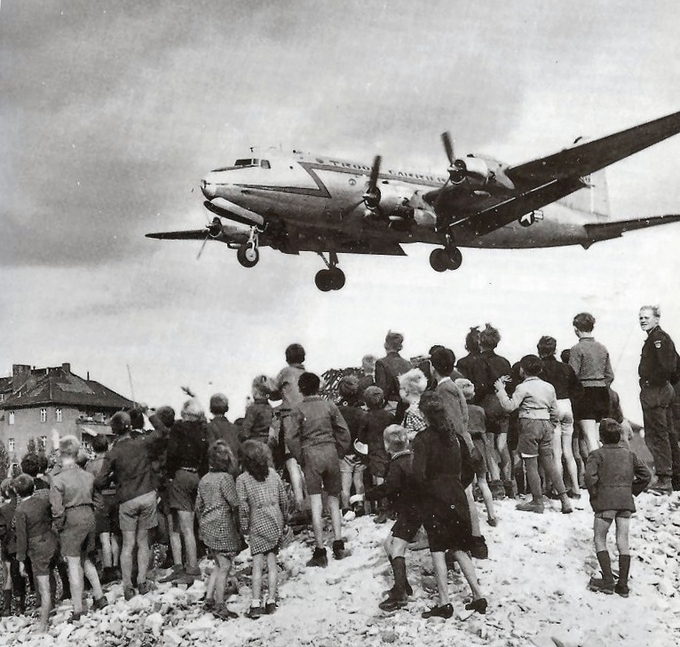 Berlin Airlift: Berliners watch an aircraft take part in the Berlin Airlift, which was a successful attempt to circumvent the Soviet blockade of non-Soviet Berlin. The Berlin Blockade and the tensions surrounding it marked the beginning of the Cold War. Containment was the Cold War policy of preventing the spread of Soviet communism (while not confronting it where it already existed). The Truman Doctrine was followed by a series of measures to contain Soviet influence in Europe, including the Marshall Plan, NATO, intelligence-gathering by the newly formed CIA, and buildup of arms. NSC 68 was a statement of U.S. security policy that argued that a massive military buildup was necessary to address the Soviet threat. détente: A relaxing of tension between major powers, especially the thawing of relations between the Soviet Union and the United States following the Cold War. rollback: The strategy of forcing change in the major policies of a state, usually by replacing its ruling regime. It contrasts with containment, which means preventing the expansion of that state and with détente, which means a working relationship with that state. Truman Doctrine: The American policy in 1947 of providing economic and military aid to Greece and Turkey because they were threatened by communism. It was the start of the containment policy to stop Soviet expansion; it was a major step in beginning the Cold War. Containment was a U.S. policy that used numerous strategies to prevent the spread of communism abroad. A component of the Cold War, this policy was a response to a series of moves by the Soviet Union to enlarge communist influence in Eastern Europe, China, Korea, and Vietnam. It represented a middle-ground position between détente and rollback. 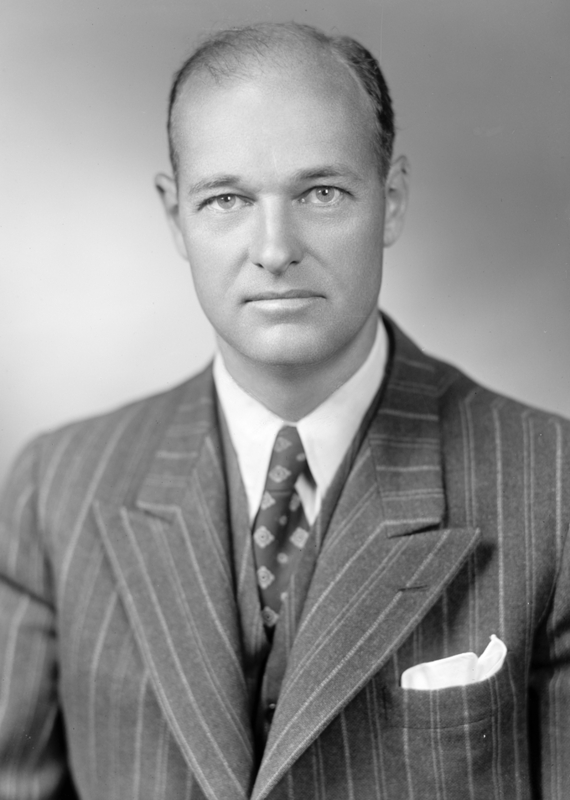 The basis of the doctrine was articulated in a 1946 cable by U.S. diplomat George F. Kennan known as the “Long Telegram.” As a description of U.S. foreign policy, the word originated in a report Kennan submitted to U.S. Defense Secretary James Forrestal in 1947, later used in a magazine article. According to Kennan, the Soviet Union did not see the possibility for long-term peaceful coexistence with the capitalist world. It was its ever-present aim to advance the socialist cause. Capitalism was a menace to the ideals of socialism, and capitalists could not be trusted or allowed to influence the Soviet people. Outright conflict was never considered a desirable avenue for the propagation of the Soviet cause, but their eyes and ears were always open for the opportunity to take advantage of “diseased tissue” anywhere in the world. George F. Kennan,1947: George Frost Kennan (February 16, 1904–March 17, 2005) was an American adviser, diplomat, political scientist, and historian, best known as “the father of containment” and a key figure in the emergence of the Cold War. The word containment is associated most strongly with the policies of U.S. President Harry Truman (1945–53), including the establishment of the North Atlantic Treaty Organization (NATO), a mutual defense pact. Although President Dwight Eisenhower (1953–61) toyed with the rival doctrine of rollback, he refused to intervene in the Hungarian Uprising of 1956. President Lyndon Johnson (1963–69) cited containment as a justification for his policies in Vietnam. President Richard Nixon (1969–74), working with his top advisor Henry Kissinger, rejected containment in favor of friendly relations (or détente) with the Soviet Union and China. President Jimmy Carter (1976–81) emphasized human rights rather than anti-communism, but dropped détente and returned to containment when the Soviets invaded Afghanistan in 1979. President Ronald Reagan (1981–89), denouncing the Soviet state as an “evil empire,” escalated the Cold War and promoted rollback. Central programs begun under containment, including NATO and nuclear deterrence, remained in effect even after the end of the war. In March 1947, President Truman, a Democrat, asked the Republican-controlled Congress to appropriate $400 million in aid to the Greek and Turkish governments, then fighting Communist subversion. Truman pledged to “support free peoples who are resisting attempted subjugation by armed minorities or by outside pressures.” This pledge became known as the Truman Doctrine. Portraying the issue as a mighty clash between “totalitarian regimes” and “free peoples,” the speech marks the onset of the Cold War and the adoption of containment as official U.S. policy. Congress appropriated the money. Truman followed his speech with a series of measures to contain Soviet influence in Europe, including the Marshall Plan and NATO, a military alliance between the U.S. and Western European nations. Because containment required detailed information about Communist moves, the government relied increasingly on the Central Intelligence Agency (CIA). Established by the National Security Act of 1947, the CIA conducted espionage in foreign lands, some of it visible, most secret. The Soviet Union’s first nuclear test in 1949 prompted the National Security Council to formulate a revised security doctrine. Completed in April 1950, it became known as NSC 68. It concluded that a massive military buildup was necessary to the deal with the Soviet threat. The Truman Doctrine was the start of the policy of containment, followed by economic restoration of Europe through the Marshall Plan. The Truman Doctrine was the 1947 American policy of providing economic and military aid to Greece and Turkey because they were threatened by communism. The Truman Doctrine was informally extended to become the basis of the Cold War policy of containment. The Marshall Plan was the Truman Administration’s plan to rebuild war-torn Europe to prevent the spread of communism, facilitate global trade and free markets, and encourage European peace. The U.S. gave $13 billion to European nations through the Marshall Plan. The Eastern European countries rejected Marshall Plan aid because of pressure from the Soviet Union, who feared non-communist influence in communist regions. The Marshall Plan ended in 1951; many argue that it was successful, as it helped European economies grow, prevented the spread of communism, and eventually helped lead to European integration. containment: A United States policy using numerous strategies to prevent the spread of communism abroad. A component of the Cold War, this policy was a response to a series of moves by the Soviet Union to enlarge communist influence in Eastern Europe, China, Korea, and Vietnam. It represented a middle-ground position between détente and rollback. Organization for European Economic Co-operation: An intergovernmental organization founded in 1948 to help administer the Marshall Plan (which was rejected by Soviet Union and its satelite states) by allocating American financial aid and implementing economic programs for the reconstruction of Europe after World War II. NATO: An intergovernmental military alliance signed on April 4, 1949. The organization constitutes a system of collective defense whereby its member states agree to mutual defense in response to an attack by any external party. The Truman Doctrine was an American foreign policy created to counter Soviet geopolitical spread during the Cold War. It was first announced to Congress by President Harry S. Truman on March 12, 1947 and further developed on July 12, 1948 when he pledged to contain Soviet threats to Greece and Turkey. American military force was usually not involved, but Congress appropriated free gifts of financial aid to support the economies and the military of Greece and Turkey. More generally, the Truman Doctrine implied American support for nations threatened by Soviet communism. The Truman Doctrine became the foundation of American foreign policy and led in 1949 to the formation of NATO, a military alliance that is still in effect. Historians often use Truman’s speech to date the start of the Cold War. Truman told Congress that “it must be the policy of the United States to support free peoples who are resisting attempted subjugation by armed minorities or by outside pressures.” Truman reasoned that because the totalitarian regimes coerced free nations, they represented a threat to international peace and the national security of the United States. Truman made the plea amid the crisis of the Greek Civil War (1946–49). He argued that if Greece and Turkey did not receive the aid that they urgently needed, they would inevitably fall to communism with grave consequences throughout the region. Because Turkey and Greece were historic rivals, it was necessary to help both equally even though the threat to Greece was more immediate. The policy won the support of Republicans who controlled Congress, and $400 million in American money but no military forces were sent to the region. The effect was to end the Communist threat, and in 1952 both countries (Greece and Turkey) joined NATO, a military alliance that guaranteed their protection. The Truman Doctrine was informally extended to become the basis of American Cold War policy throughout Europe and around the world. It shifted American foreign policy toward the Soviet Union from détente (a relaxation of tension) to a policy of containment of Soviet expansion as advocated by diplomat George Kennan. It was distinguished from rollback by implicitly tolerating the previous Soviet takeovers in Eastern Europe. The Truman Doctrine underpinned American Cold War policy in Europe and around the world, and endured because it addressed a broader cultural insecurity regarding modern life in a globalized world. It dealt with U.S. concern over communism’s domino effect and mobilized American economic power to modernize and stabilize unstable regions without direct military intervention. It brought nation-building activities and modernization programs to the forefront of foreign policy. The Truman Doctrine became a metaphor for emergency aid to keep a nation from communist influence. Truman used disease imagery not only to communicate a sense of impending disaster in the spread of communism but also to create a “rhetorical vision” of containing it by extending a protective shield around non-communist countries throughout the world. The Marshall Plan (officially the European Recovery Program) was an American initiative to aid Western Europe, in which the United States gave $13 billion in economic support to help rebuild Western European economies after the end of World War II. The initiative was named after Secretary of State George Marshall. The Plan was largely the creation of State Department officials such as George F. Kennan. The plan was established on June 5, 1947, and was in operation for four years beginning in April 1948. 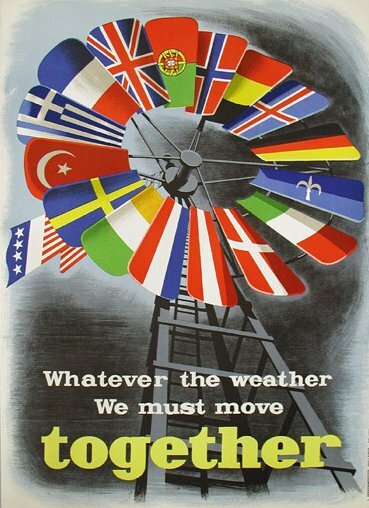 Marshall Plan Poster: One of a number of posters created to promote the Marshall Plan in Europe. Note the pivotal position of the American flag. The Marshall Plan sought to rebuild a war-devastated region, modernize industry, bolster European currency, and facilitate international trade, especially with the United States, whose economic interest required Europe to become wealthy enough to import U.S. goods. One of the main goals, however, was to contain the growing Soviet influence in Europe and prevent the spread of communism. The Marshall Plan required a lessening of interstate barriers and a dropping of many regulations, and encouraged an increase in productivity, labor union membership, and the adoption of modern business procedures. 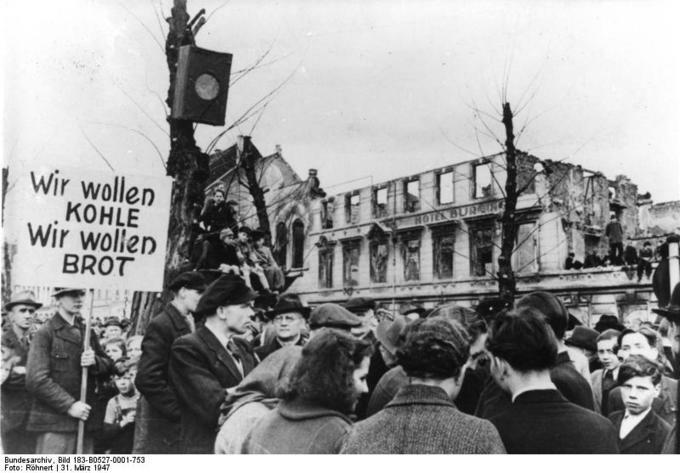 The Hunger-Winter of 1947: Thousands protest in West Germany against the disastrous food situation (March 31, 1947). Sign: We want coal, we want bread. The Marshall Plan was designed to help rebuild war-torn Europe, and thus make Europe less susceptible to Communist threats. The Marshall Plan offered the same aid to the Soviet Union and its allies, but they did not accept it as to do so would be to allow a degree of U.S. control over the Communist economies. The non-participation of Eastern Europe was one of the first clear signs that the continent was now divided. The Marshall Plan aid was divided among the participant states on a roughly per capita basis. A larger amount was given to the major industrial powers, as the prevailing opinion was that their resuscitation was essential for a general European revival. During the four years that the plan was operational, $13 billion in economic and technical assistance was given to help the recovery of the European countries that had joined in the Organization for European Economic Cooperation. This was on top of $13 billion in American aid already given. By 1952 when funding ended, the economy of every participant state had surpassed prewar levels; for all Marshall Plan recipients, economic output in 1951 was at least 35% higher than in 1938. Over the next two decades, Western Europe enjoyed unprecedented growth and prosperity, but economists are not sure what proportion was directly or indirectly due to the Plan. The Marshall Plan was one of the first elements of European integration, as it erased trade barriers and set up institutions to coordinate the economy on a continental level—that is, it stimulated the total political reconstruction of western Europe. Many felt that European integration was necessary to secure the peace and prosperity of Europe, and thus used Marshall Plan guidelines to foster integration. The Marshall Plan was originally scheduled to end in 1953. Any effort to extend it was halted by the growing cost of the Korean War and rearmament. American Republicans hostile to the plan had gained seats in the 1950 Congressional elections, so conservative opposition to the plan was revived. Thus, the plan ended early in 1951, though various forms of American aid to Europe continued. The political effects of the Marshall Plan may have been just as important as the economic ones. Marshall Plan aid allowed the nations of Western Europe to relax austerity measures and rationing, reducing discontent and bringing political stability. The communist influence on Western Europe was greatly reduced, and throughout the region communist parties faded in popularity in the years after the Marshall Plan. The trade relations fostered by the Marshall Plan helped forge the North Atlantic alliance that would persist throughout the Cold War. At the same time, the non-participation of the states of Eastern Bloc was one of the first clear signs that the continent was now divided. Originally created in response to the Soviet threat, NATO is an intergovernmental mutual defense organization. NATO was created by the North Atlantic Treaty in 1949, partly as a response to the Soviet Blockade of Berlin. The original members of NATO included the Treaty of Brussels members (Belgium, the Netherlands, Luxembourg, France, and the UK), but also added Canada, Portugal, Italy, Norway, Denmark, Iceland, and the U.S.
NATO’s goal was to be a mutual defense organization: an armed attack against any member would be considered an attack against them all. This provision was stated in Article 5 of the NATO agreement. In its early years, NATO primarily existed as a political organization. However, the Korean War united NATO members against the communist threat, and galvanized the creation of an integrated command structure. In 1952, Greece and Turkey joined NATO. In 1954, the Soviet Union suggested it should join, but NATO members refused, fearing the Soviet’s intentions were to weaken the alliance from the inside. When West Germany was integrated into NATO in 1955, the Soviet Union responded by forming the Warsaw Pact. NATO did not initiate any military intervention until after the end of the Cold War, first in Yugoslavia and then in Afghanistan. Warsaw Pact: A pact (long-term alliance treaty) signed on May 14, 1955, in Warsaw by the Soviet Union and its Communist military allies in Europe; it was comparable and opposed to NATO. Korean War: (June 25, 1950 – July 27, 1953) A war between Communist-led North Korea and US-aligned South Korea. It was primarily the result of the political division of Korea by an agreement of the victorious Allies at the conclusion of the Pacific War at the end of World War II. The North Atlantic Treaty Organization (NATO) is an intergovernmental military alliance based on the North Atlantic Treaty, which was signed on April 4, 1949. The organization constitutes a system of collective defense in which member states agree to mutual defense in response to an attack by any external party. NATO’s headquarters are in Brussels, Belgium, one of the 28 member states across North America and Europe. An additional 22 countries participate in NATO’s Partnership for Peace, with 15 other countries involved in institutionalized dialogue programs. The combined military spending of all NATO members constitutes over 70% of the world’s defense spending. The Treaty of Brussels, signed on March 17, 1948, by Belgium, the Netherlands, Luxembourg, France, and the United Kingdom, is considered the precursor to the NATO agreement. This treaty and the Soviet Berlin Blockade led to the creation of the Western European Union’s Defense Organization in September 1948. However, participation of the United States was thought necessary both to counter the military power of the USSR and prevent the revival of nationalist militarism, so talks for a new military alliance began almost immediately. These new negotiations resulted in the North Atlantic Treaty, signed in Washington, D.C. on April 4, 1949. It included the five Treaty of Brussels states plus the U.S., Canada, Portugal, Italy, Norway, Denmark, and Iceland. This Treaty formally created NATO. In Article 5 of the charter, the members agreed that an armed attack against any one of them in Europe or North America would be considered an attack against them all. Consequently, they agreed that if an armed attack occurred, each of them would assist the member being attacked, taking such action as it deemed necessary, including the use of armed force, to restore and maintain the security of the North Atlantic area. The treaty does not require members to respond with military action against an aggressor. Although obliged to respond, they maintain the freedom to choose the method by which they do so, although it is assumed that NATO members will aid the attacked member with military force. During the Cold War, doubts over the strength of the relationship between Europe and the U.S. ebbed and flowed, along with doubts over the credibility of the NATO defense against a prospective Soviet invasion. These doubts led to the development of the independent French nuclear deterrent and the withdrawal of the French from NATO’s military structure in 1966. For its first few years, NATO was not much more than a political association; the first NATO Secretary General, Lord Ismay, stated in 1949 that the organization’s goal was “to keep the Russians out, the Americans in, and the Germans down.” However, the Korean War galvanized the member states, and an integrated military structure was built up under the direction of two U.S. supreme commanders. The outbreak of the Korean War in June 1950 was crucial for NATO as it raised the apparent threat of all Communist countries working together and forced the alliance to develop concrete military plans. Supreme Headquarters Allied Powers Europe (SHAPE) was formed to direct forces in Europe and began work under Supreme Allied Commander Dwight D. Eisenhower in January 1951. In September 1950, the NATO Military Committee called for an ambitious buildup of conventional forces to meet the Soviets, subsequently reaffirming this position at the February 1952 meeting of the North Atlantic Council in Lisbon. The Lisbon conference sought to provide the forces necessary for NATO’s Long-Term Defense Plan. In September 1952, the first major NATO maritime exercises began; Exercise Mainbrace brought together 200 ships and more than 50,000 personnel to practice the defense of Denmark and Norway. Other major exercises that followed included Exercise Grand Slam and Exercise Longstep, naval and amphibious exercises in the Mediterranean Sea; Italic Weld, a combined air-naval-ground exercise in northern Italy; Grand Repulse, involving the British Army on the Rhine (BAOR), the Netherlands Corps, and Allied Air Forces Central Europe (AAFCE); Monte Carlo, a simulated atomic air-ground exercise involving the Central Army Group, and Weldfast, a combined amphibious landing exercise in the Mediterranean Sea involving American, British, Greek, Italian, and Turkish naval forces. Greece and Turkey joined the alliance in 1952, forcing a series of controversial negotiations over how to bring the two countries into the military command structure. In 1954, the Soviet Union suggested that it should join NATO to preserve peace in Europe. NATO countries, fearing that the Soviet Union’s motive was to weaken the alliance, ultimately rejected this proposal. The incorporation of West Germany into the organization on May 9, 1955, was described as “a decisive turning point” in the history of Europe. A major reason for Germany’s entry into the alliance was that without German manpower, it would have been impossible to field enough conventional forces to resist a Soviet invasion. One of the immediate results of West Germany’s integration into NATO was the creation of the Warsaw Pact, which was signed on May 14, 1955, by the Soviet Union, Hungary, Czechoslovakia, Poland, Bulgaria, Romania, Albania, and East Germany. The Warsaw Pact was a formal response to West Germany’s integration and clearly delineated the two opposing sides of the Cold War. While the Warsaw Pact was established as a balance of power or counterweight to NATO, there was no direct confrontation between them. Instead, the conflict was fought on an ideological basis. Both NATO and the Warsaw Pact led to the expansion of military forces and their integration into the respective blocs. 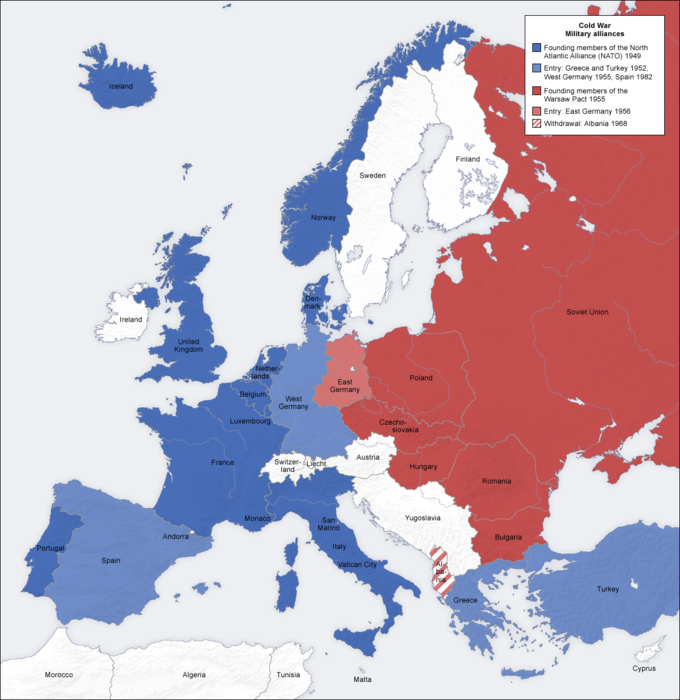 Cold War European Military Alliances Map: During the Cold War, most of Europe was divided between two alliances. Members of NATO are shown in blue, mostly in western Europe plus Greece and Turkey, with members of the Warsaw Pact in red, in eastern Europe. After the fall of the Berlin Wall in 1989, the organization was drawn into the breakup of Yugoslavia and conducted its first military interventions in Bosnia and later Yugoslavia in 1999. Politically, the organization sought better relations with former Cold War rivals, which culminated with several former Warsaw Pact states joining the alliance in 1999 and 2004. The September 2001 attacks signaled the only occasion in NATO’s history when Article 5 of the North Atlantic treaty has been invoked as an attack on all NATO members. After the 9/11 attack, troops were deployed to Afghanistan under NATO’s leadership, and the organization continues to operate in a range of roles, including sending trainers to Iraq, assisting in counter-piracy operations, and most recently enforcing a no-fly zone over Libya.